What is shaking in your corner of the world? Are you and your home going through the change? A few years ago, I had these red accent walls in the living room. And of course, it was Christmas, but I also had lots of clutter. Then the walls turned brown (thanks to David). And I boxed up lots of clutter. 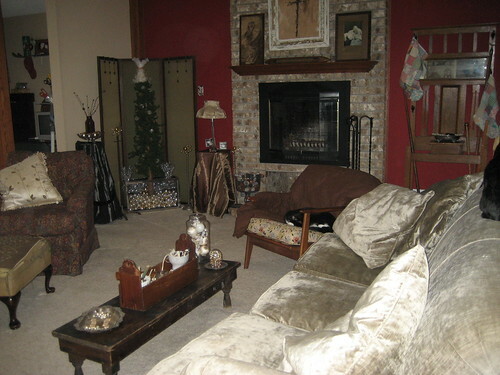 The fireplace is flanked with the color brown, but the other walls in the room (and house) are Dapper Tan. 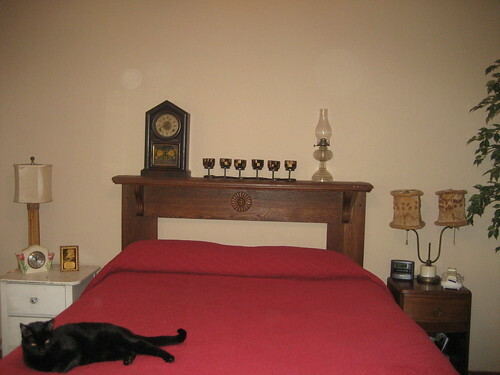 Here is my master bedroom a few years ago. And here it is now. A few changes. 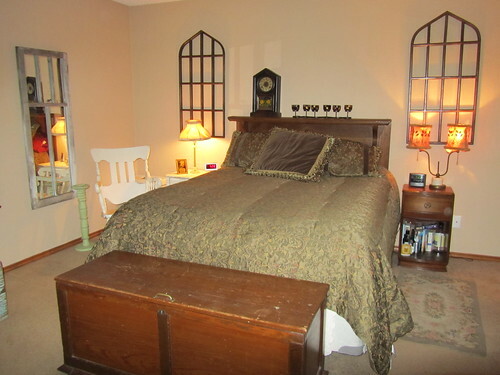 Most recently, those wood pieces on the wall flanking the bed were hung. I am loving them! Still needs a little more change, in my book. I'm thinking paint. As a very dear friend says: "Paint is cheap." A new color? An accent wall? (Are accent walls "done" anymore?) White? Cream? Huh. What do you think? Any changes happening in your home? idk, i think it looks pretty darn good just like it is! i think my *haircut* philosophy applies here: i cut my hair, don't like it, it always grows! paint ~ don't like it ~ paint it again! do what you love and it will always be the right thing! I don't know. 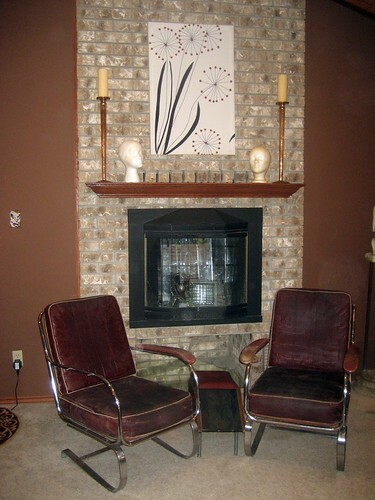 I think those old leather and chrome chairs are pretty nasty looking in your new living room. You should let me come up and take them to the dump for ya'.. Just sayin'.. I have too many house projects to finish to think about changing color, but I definitely think you should paint. Freshly painted walls have the power to enliven. Ok, so maybe that was a bit dramatic, but they sure can give you a lift. I say paint.it.all. I think it looks GREAT and I love the windows also. I do agree that paint is cheap, however fixing the mess I make when I paint is not. So I try hard to love the color for a very, very long time. If you are good at painting or have someone who is (David), then I say go for it! Happy New Year! Love the new look in your bedroom. I need to get motivated and do a little decluttering around here! I love the idea of an accent wall in the bedroom to show off those flanking wooden pieces even more - something darker and even more dramatic! Thanks for opening your home to us...happy new year. Sandy, The Tattered House. How about a nice shade of green? 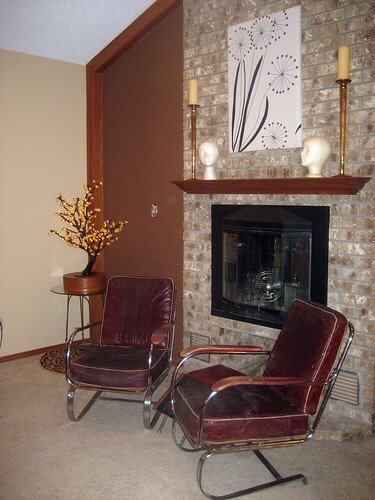 Try an accent wall first, live with it awhile, then if you want, paint the other walls too. Go for paint! I like green or a coffee with cream color-darker than what you have, lighter than the fireplace wall. A warm grey would be good too! I love youre new simpiler look! I adore the chairs by the fireplace. I saw some red ones by the register area of an antique mall...tried to buy them, but he would not sell! He said they came out of a barber shop.